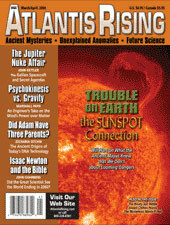 The following article appeared in the March/April 2004 issue of Atlantis Rising magazine. The author writes further about Manly P. Hall in Occult America (Bantam). To speak of special gifts or powers possessed by contemporary spiritual teachers is to enter risky territory. Charlatanism and chicanery are wearily familiar among “messengers” who claim to possess clairvoyant perception, channeled wisdom, or supernormal abilities. Yet once in a great while a man or woman produces an achievement that eludes easy explanation – something that strains the bounds of our ordinary efforts at evaluation. In the case of Canadian-born spiritual scholar Manly P. Hall, such an achievement came in the form of a single book, though Hall would write many in a career that spanned much of the last century. In 1928, Hall self-published what may be the most thorough, learned, and variegated codex to the esoteric wisdom and mysteries of antiquity: The Secret Teachings of All Ages – completed before he had turned 28 years of age. Originally published in an oversized, coffee-table format, the Secret Teachingswas expensive, hefty, and sometimes cumbersome to read. As a result, the book spent much of its seventy-five year life as the closely held – though widely venerated – treasure of students of ancient mysteries and the occult. Late last year, however, the Secret Teachings was made broadly available for the first time in an affordable and compact edition. Yet even in its new reader-friendly format, the book’s sheer depth of material retains its ability to astound: Pythagorean mathematics; alchemical formulae; Hermetic doctrine; the workings of the Kabala; the geometry of Ancient Egypt; the Native American myths; the uses of cryptograms; an analysis of the Tarot; the symbols of Rosicrucianism; the esotericism of the Shakespearean dramas – these are just a few of Hall’s topics. The scale of his bibliography alone is extraordinary. Its nearly 1,000 entries range from the core works of Plato, Aristotle, and Augustine, to translations of the Gnostic, Nicene, and Hermetic literature, to the writings of Paracelsus, Ptolmey, Bacon, Basil Valentine, and Cornelius Argippa, to works of every variety on the ancient and esoteric philosophies – religious, mythic, or metaphysical – that have expressed themselves in symbol or ceremony. Who was this great and gifted master of ancient wisdom? His early life provides few clues to his virtuosity: Hall attended no formal university, his roots in Canada and the American West were comfortable if ordinary, his youthful letters betray no special fluency with the complexities of the ancient world, and one of his first forays into professional life was as a clerk at a Wall Street banking firm. Can we simply conclude that the Secret Teachings was the effort of a precocious and preternaturally gifted young man? One is tempted to say so, and yet: the sheer volume and depth of understanding presented in his book – it would seem to be the product of a whole lifetime, and a worthy one at that; his having written it before age 28 with none of the resources we take for granted today; his mastery of subjects ranging from Egyptian geometry to Greek philosophy to the complexities of Kabala, are nothing less than jaw dropping. The question reasserts itself on nearly every page: How did this large-framed young man with little formal education produce the last century’s most unusual and masterly book on the esoteric wisdom of antiquity? Hall was born in Ontario on March 18th, 1901 to a father who was, according to one close admirer, a dentist by profession and a mother who was a chiropractor. One scholar of Hall’s work reports that his parents later divorced and young Manly was raised by his maternal grandmother. In 1985, Hall wrote Growing Up With Grandmother, a tribute to the woman he called “Mrs. Arthur Whitney Palmer.” The short book is notable, in a sense, for what it reveals about Hall’s reticence to broach virtually any personal aspect of his childhood or adolescence. Born at the close of the Victorian Era, here was a man perhaps marked by a period in which the details of private life were not easily shared. While Hall had little traditional schooling, one can follow a beeline through his early twenties that suggests a burgeoning interest in foreign travel and esoteric traditions: He wrote letters from Japan, Egypt, China, and India; he gave public lectures on arcane topics; he was reported to have studied for a time with Houdini; and he was named a minister by a liberal metaphysical congregation in Los Angeles called the Church of the People. For all his growing achievements, Hall’s literary output in those early years could be called uneven. His published letters contain little of the eye-opening detail or wonder of discovery that one finds in the writings of other early 20th century seekers encountering the East for the first time. Sometimes his letters from abroad read like little more than prosaic, if sensitive, linear travel diaries of their day. Like a bolt from the blue, however, one is astounded to suddenly discover a short work of immense power from the young Hall – a book that seems to prefigure that which would come. In 1922, at the age of 21, Hall wrote a luminescent gem on the mystery schools of antiquity, Initiates of the Flame. Though brief, one sees in it the outlines of what would become The Secret Teachings of All Ages. On its frontispiece, Initiates of the Flame boldly announces: “He who lives the Life shall know the Doctrine.” The short book goes on to expound passionately and in detail on Egyptian rites, Arthurian myths, and the secrets of alchemy, among other subjects. Feeling the power and ease in its pages, one can almost sense the seeds of greatness that were beginning to take hold in Hall’s grasp of esoteric subjects. Hall collaborated on the work with artist J. Augustus Knapp, with whom he would later design a Tarot deck and whose paintings – grand re-imaginings of ancient events – would later run throughout the Secret Teachings. Another factor behind the birth of the Secret Teachings may have been the young Hall’s reaction to the times he lived in: the Roaring Twenties. Hall was alarmed by the materialism of the day, which he encountered firsthand in his brief career at a Wall Street brokerage firm just before the Great Depression. In one preface to the Secret Teachings, Hall described the “outstanding event” of his Wall Street career as “witnessing a man depressed over investment losses take his life.” One could imagine the young, spiritually minded Hall worrying whether the fading Jazz Age-frenzy that gripped our culture would spell ultimate decline for our fluency in ethics, religion, myth, symbol, and the love of learning that characterized his later work. By 1928, Hall succeed in publishing his completed opus in a self-financed first printing of 2,200 copies, and the work – called “The Great Book” by its admirers – would never be out of print thereafter. In 1934, Hall founded the Philosophical Research Society (www.prs.org) in Los Angeles, which has published sumptuous, oversized editions of his volume ever since. In an historic first in spiritual publishing, my colleagues and I at Tarcher/Penguin (where I am executive editor) recently partnered with PRS to produce an alternate “Reader’s Edition” of The Secret Teachings of All Ages. While existing editions remain in print, this reset, reformatted, compact-sized, and affordably priced trade paperback makes the complete text of the Secret Teachings available to a large general audience for the first time. Hall’s original volume is composed of varying columns, captions, and inset text – sometimes as jarring to the Western eye as a page of Babylonian Talmud. Hence, the task of newly formatting the work into a faithful, but reader-friendly, edition was ambitious – and arduous. At expenses that ran into many thousands of dollars – and amid surprising complexities – we began the process by electronically scanning the full text. When an entirely new manuscript of more than 1,400 pages landed on my desk in a pile about 8-inches high – as though it had just rolled off of Hall’s Edwardian-era typewriter – it was a shocking experience: here was the freshly minted manuscript of a work that had stood largely unaltered for a lifetime. It was, however, revealing, in one of many senses, to dissect and reassemble the text of the Secret Teachings. Like a literal translation of the endlessly fascinating Chinese wisdom book the Tao Te Ching, one can take apart and scrutinize a whole work, put it back together again, and realize that you’ve come no closer to solving its mystery. It would be asking too much of Hall – or any great teacher – to suggest that he always found his mark. His literary or religious essays sometimes dwell on narrow points, such as a 1946 consideration of Ralph Waldo Emerson’s meditation on spiritual laws, Compensation, in which Hall appears to miss the work’s full scope. Nor was Hall always judicious. In the first issue of his quarterly journal Horizon in 1941, he published an astoundingly insensitive essay entitled, “The Jew Does Not Fit In,” in which he postulated that Jewish business practices were Oriental in nature and therefore chaffed at contemporary Western sensibilities. Measured against more than half a century’s public output – in which Hall pled for a human family that transcends religion or nation – the essay appears a stark anomaly. Hence, in the figure of Manly Hall, we find remarkable powers of discernment mixed with the profound flaws of the most ordinary person. But still the question remains: How did a modest, solidly built young man craft what can be considered a one-of-a-kind codex to the ancient occult and esoteric traditions of the world – all before his 28th birthday? To read Hall’s work is to experience a readerly joy rarely associated with ordinary compendiums of wisdom – its depth, breadth, and detail are, simply put, not ordinary, and not easily understood. Standing beside both these dear American friends of mine, I was wondering with trepidation in my heart what reply Mr. Hall would make. To the question of how Hall achieved what he did, some of his admirers suggest that he was born with knowledge from other lifetimes; others that he had a photographic memory. In the end, perhaps one can only conclude such a question with still more questions. But this much is clear: Readers who discover The Secret Teachings of All Ages for the first time today will encounter a book probably unlike any they have seen before. The accomplishment of the Secret Teachings, in part, is that it may be the only serious compendium of the last several hundred years that takes the world of myth and symbol on its own terms. Hall realized, perhaps more deeply than any other scholar of his time, that the ancients possessed extraordinary powers of observation – ways of understanding the correspondences between the outer natural world and man’s inner state – that were equally potent, and equally worthy of study, as their gifts for calendars, architecture, reason, and agriculture. One can read, for example, his masterly twelfth chapter, “Wonders of Antiquity,” and learn something about what was experienced – at least so far as we can venture – in the consultation of the oracle at Delphi. Perhaps speculative at times, his seventh chapter, “The Initiation of the Pyramid,” conveys something of the marvel of Egypt’s priestly rites, from an age when the rise of monotheism was as distant to the Egyptian adept as he is to us. They all move, but also pass on. This, in a sense, is the universal voice that finds its way into each century to tell of the wonders of the past. It found its way to the 20th – and now the 21st – century through Manly P. Hall. His is the voice that runs like a luminescent thread through history telling the stories of those who have passed, not as a distant judge, but as a lover of the knowledge embodied in the ancient ways. Manly P. Hall; The Secret Teachings of All Ages: Reader’s Edition; Tarcher/Penguin; 2003; Philosophical Research Society; 1928. “Initiates of the Flame;” Collected Writings, Vol. 1; Philosophical Research Society; 1958. “The Jew Does Not Fit In;” Horizon; volume 1; number 1; August 1941. “Emerson’s Essay on the Law of Compenstation;” Horizon; volume 6; number 1, Summer 1946. Demetrio Sodi Morales; The Maya World; Minutiae Mexicano; 1976. Basanta Koomar Roy; “America’s Timeless Philosopher;” reprinted from Wynn’s Astrology Magazine; Horizon; vol. one; number 4; Nov.-Dec. 1941.